For Luciana, this year’s “convention season” will begin this weekend in her old hometown with the Toronto Comic Con, but in the recent weeks and months, additional photos from last year’s conventions have appeared, so now is about time for a roundup. Flickr user carencey hast posted a gallery with pictures from the Big Apple Comic Con, many of which show Luciana. 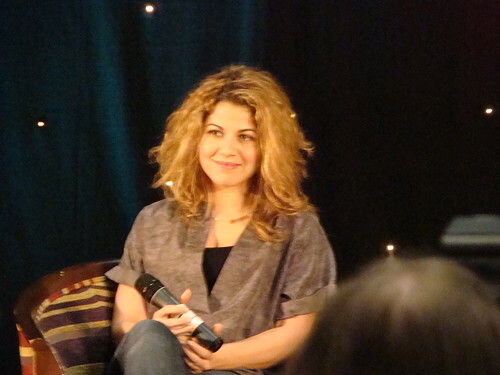 Also from carencey are many photos of Luciana during several Q&A panels at the Dragon*Con 09, while FireflyFan posted this very lovely photo from the same convention. There are also several photos from the Mission Starfury con in London. Alias Aly has posted this very beautiful photo and three others, while vagueonthehow uploaded this lovely gallery. Now let’s hope this year the attendees at Luciana’s conventions will be just as busy snapping pictures as last year, so we can look forward to many beautiful photos of her. And if we are lucky, the first ones will appear within the next few days. This entry was posted in Other and tagged Big Apple Comic-Con, Conventions + Events, DragonCon, Pictures, Starfury Cylon Attack, Wizard World Philadelphia. Bookmark the permalink.